138 Marlborough is located on the south side of Marlborough, between Clarendon and Dartmouth, with 136 Marlborough to the east and 140 Marlborough to the west. 138 Marlborough was designed and built in 1891 by O. H. Drisko and Son, architects and builders, for real estate dealer and auctioneer George W. Nason, as a four-unit apartment building. He is shown as the owner on the original building permit application, dated February 10, 1891, and on the final building inspection report, dated October 23, 1891. In his Houses of Boston’s Back Bay, Bainbridge Bunting indicates that 138 Marlborough was designed by A. K. Drisko. There is no A. K. Drisko listed in the Boston City Directories for the period, but this may be a flawed reference to Alonzo Burton Drisko, who was the son of Oramander H. Drisko and a partner in O. H. Drisko and Son, the firm shown as the architect, builder, and mason on the building inspection report for 138 Marlborough. Bunting also indicates that the 1891 house replaced a house built in 1872, one of nine (132-148 Marlborough) built at the same time for building contractor John Farrington. This is incorrect. John Farrington built eight houses, three to the east of 138 Marlborough in 1871-1872 (132-136 Marlborough), and five more to the west in 1872-1873 (140-148 Marlborough). 138 Marlborough remained a vacant lot until 1891. George Nason purchased the land for 138 Marlborough on January 20, 1891, from Eliza Jones (Hersey) Andrew, the widow of John Albion Andrew, who had served as Governor of Massachusetts during the Civil War. Eliza Andrew had inherited the property from her maternal aunt, Sarah Jones of Hingham, who had died in March of 1889. Sarah Jones had purchased the lot from the Commonwealth of Massachusetts on April 9, 1863, and had left it vacant. Click here for an index to the deeds for 138 Marlborough. 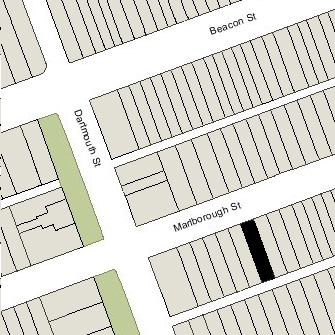 On February 16, 1891, George Nason entered into a party wall agreement with the owners of 136 Marlborough, Edward and Frank Moseley, trustees for the benefit of their mother Mary (Crehore) Moseley, the widow of Thomas Edward Moseley. The eastern wall of 140 Marlborough had not been placed so that the boundary line between 138 and 140 Marlborough ran precisely down the middle of the 12 inch thick wall. Accordingly, on February 21, 1891, George Nason purchased a small strip of land under the wall from James Lovell Little, Jr., of 140 Marlborough. George Nason and James L. Little, Jr., then entered into a party wall agreement governing the wall. 138 Marlborough was first occupied for the 1891-1892 winter season. The earliest residents included: Caroline (Metcalf) Plumer (who lived there through 1905), the widow of flour merchant Avery Plumer, who previously had lived at 130 Marlborough; Mrs. Edith Barrett (Marsh) Binney (through 1931), the former wife of George Hayward Binney (an insurance broker who fled Boston in 1889 having defrauded several banks), who previously had lived at 35 Commonwealth with her widowed mother, Julia Maria (Barrett) Marsh; Dr. Frances M. Morris (through 1905), a physician; and Dr. Sarah Sweet Windsor (through 1903), a homeopathic obstetrician. Dr. Morris and Dr. Windsor also maintained their offices at 138 Marlborough. On March 20, 1895, 138 Marlborough was acquired from Augustus Arnold by Annie Louise (Lobdell) Motte, the wife of attorney Ellis Loring Motte. They lived at the Hotel Ludlow (southwest corner of Clarendon and St. James) and, before that, had lived at 389 Beacon (which they continued to own). By the 1897-1898 winter season, they had moved to one of the apartments at 138 Marlborough, where they continued to live during the 1904-1905 winter season. 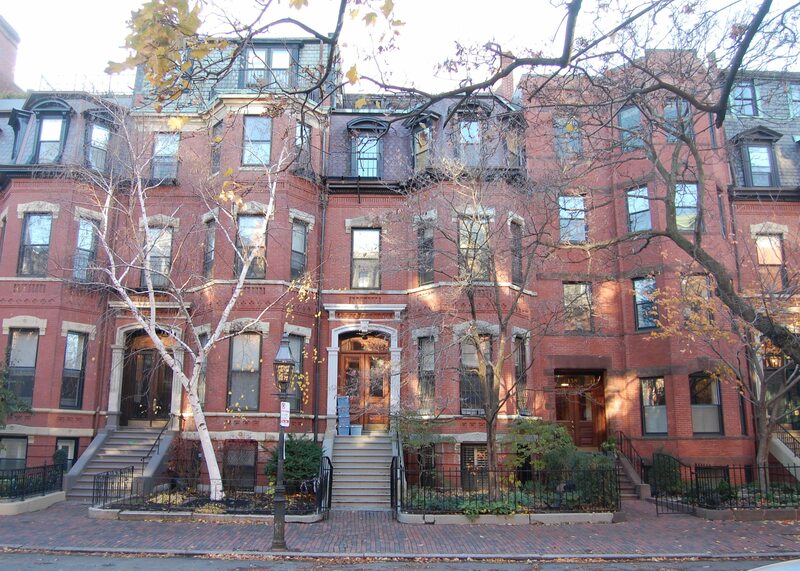 By the 1906-1907 season, they were living at Hemenway Chambers (Westland Avenue at Hemenway Street). Annie Motte continued to own 138 Marlborough. Among the apartment residents at 138 Marlborough during the first decade of the 1900s were attorney Burrill Devereaux Barker and his wife, Irene Fitch (Shepard) Barker. They lived there from soon after their marriage in January of 1907 until 1912. By the 1912-1913 winter season, they were living at 313 Marlborough. Also residents of 138 Marlborough during this period were Richard Darwin Ware, an attorney, and his wife, Margaret Josephine (Whitman) Ware. They had been married in November of 1905 and moved to 138 Marlborough soon thereafter. Prior to their marriage, Richard Ware had lived at 237 Marlborough with his mother, Adelaide Frances (Dickey) Ware, the widow of Darwin Erastus Ware. 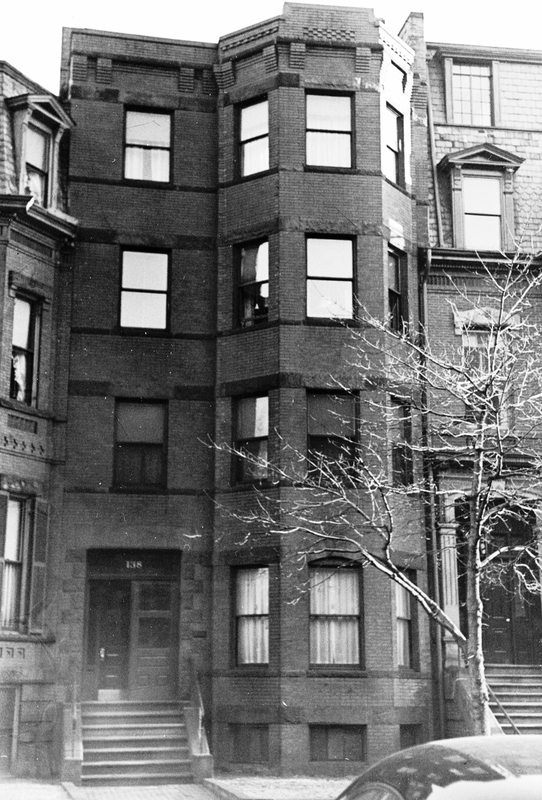 In about 1910, Adelaide Ware moved to 138 Marlborough, either to live with Richard and Margaret Ware or in another of the apartments. By 1912, they all had moved and Richard and Margaret Ware were living in Brookline. Annie Motte died in August of 1910, and Ellis Motte died in March of 1912. 138 Marlborough continued to be owned by Annie Motte’s estate until May 12, 1924, when it was acquired by real estate dealer William J. Stober. On April 10, 1925, 138 Marlborough was acquired from William Stober by John Valentine Dittemore. John Dittemore and his wife, Edith Louise (Bingham) Dittemore, lived in one of the apartments at 138 Marlborough during the 1928-1929 winter season. They previously had lived in an apartment at 45 Commonwealth. They separated soon after moving to 138 Marlborough. By the time of the 1930 US Census, he was living alone in Washington DC (he subsequently moved to New York City, where he died in May of 1937), and by 1931, she was living in an apartments at 45 Commonwealth, where she also maintained an office as a Christian Science practitioner. Burrill Devereux Barker, Jr., and Archibald G. Monks, as trustees under the will of John P, Monks, held a mortgage in 138 Marlborough given by John Dittemore. On March 17, 1933, they foreclosed and took possession of the property. B. Devereaux Barker had been born at 138 Marlborough in January of 1912 when his parents, Burrill Devereux Barker and Irene Fitch (Shepard) Barker, had lived there. In May of 1933, he married Jean Lamont Proctor. After their marriage, they lived in an apartment at 138 Marlborough. They continued to live there during the 1936-1937 winter season, but moved to 166 Marlborough thereafter. Other long-term residents of 138 Marlborough in the 1930s and 1940s were Manfred and Elfrieda (Kohring) Bowditch, who lived there from about 1932 through 1945. A former metals dealer, he was director of the Massachusetts Division of Occupational Hygiene. He later became the Lead Institute of America’s director of health and safety. On November 1, 1941, 138 Marlborough was acquired from B. Devereux Barker and Archibald Monks by Talbot Ward and his wife, Luella May (Chapman) Ward. He was an optician with Massachusetts General Hospital The Wards lived at 118 Charles and operated lodging houses at 118 and 120 Charles. The property changed hands and on May 29, 1946, was acquired by real estate agent David Orr Blair. He was unmarried and lived at 138 Marlborough with his mother, Elizabeth (Orr) Blair, the widow of Hugh Blair. They previously had lived in Somerville. In December of 1948, he applied for permission to convert the property from four apartments into two apartments and a lodging house. In June of 1949, he applied again, seeking permission to convert the property from four apartments to one apartment and a lodging house. In both cases, the applications were denied because of lack of egress from the fifth floor. In September of 1950, he applied again for permission to convert the property to one apartment and a lodging house, specifying that the apartment would be on the first floor, the next three floors would be used for lodging, and the fifth floor would not be occupied. The application was approved with this limitation. David Blair and his mother continued to live at 138 Marlborough, operating it as a lodging house. In the mid-1950s, they were joined by his brother, Hugh Blair, a mechanic, who also was unmarried. He previously had lived at 1827 Hyde Park Avenue. Elizabeth Blair died in 1959, and David and Hugh Blair moved soon thereafter. On September 8, 1959, 138 Marlborough was acquired from David Blair by Mary F. Page. She lived at 127 Commonwealth, where she operated a lodging house. On May 9, 1960, she transferred the property to herself and Margaret E. Daley. On July 2, 1962, 138 Marlborough was acquired from Mary Page and Margaret Daley by Harry Freedman, trustee of the Rainbow Realty Trust, who operated the property as the Blair House Dormitory. He and his wife, Lillian R. (Zacks/Sacks) Freedman, lived in Newton. In December of 1962, he applied for (and subsequently received) permission to allowing lodging on the fifth floor, adequate egress having been provided. In November of 1964, the Rainbow Realty Trust applied for (and subsequently received) permission to convert the property from a lodging house into a dormitory (conforming the legal status to the use already in place). By 1966, it was known as the Riverview Dormitories. On September 6, 1968, 138 Marlborough was acquired from Harry Freedman by Back Bay Dormitories, Inc. (Edward J. Tassinari, president). It continued to operate the property as a dormitory. By 1968, Back Bay Dormitories also owned 198, 200, 202, 204, and 206 Commonwealth. On December 29, 1986, it transferred all of these properties to Newbury College, which continued to operate 138 Marlborough as a dormitory. On August 16, 1994, Ralph F. Cox, trustee of the 138 Marlborough Street Realty Trust, purchased 138 Marlborough from Newbury College. 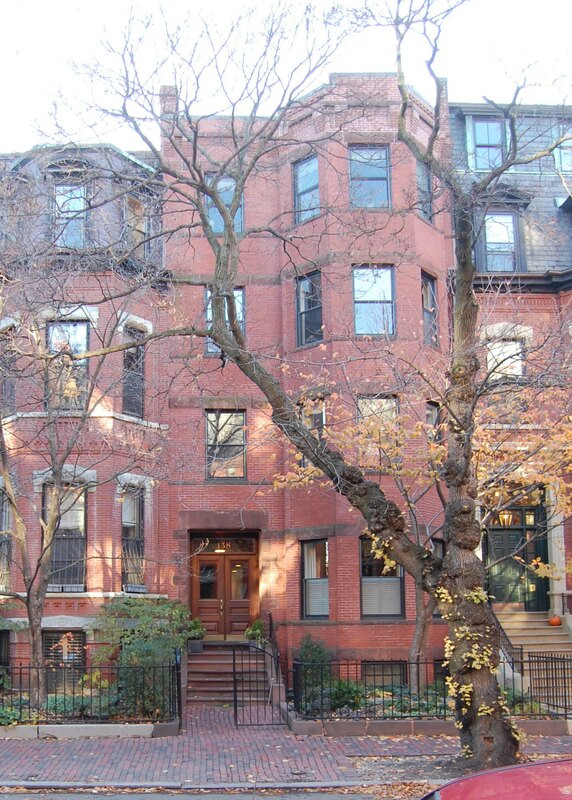 He converted the property back into four apartments and, on May 31, 1995, he converted the four apartments into condominium units, the 138 Marlborough Street Condominium.